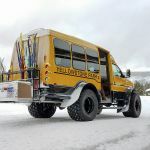 The ski shuttle departs the Mammoth Hot Springs Hotel for the Indian Creek Cross Country Ski Area three times a day. Once the skiers are dropped off, the driver returns to the Mammoth to pick up the next group of skiers. 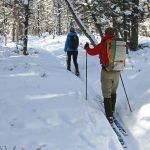 It is suggested that skiers bring a lunch. 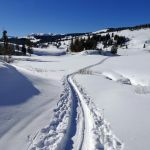 Guests have the option to either ride the shuttle back to the Mammoth Hot Springs or ski back as there is a ski trail that connects Mammoth Hot Springs Village and Indian Creek. 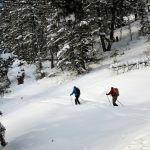 However, this connecting trail is only for experienced skiers in excellent physical condition. Guests taking the 1:30pm skier shuttle MUST ski back to Mammoth Hot Springs as there will be no pick-up after 3pm.